Ohio State Buckeyes players celebrate against the Notre Dame Fighting Irish during the second half of the Gotham Classic at Madison Square Garden. The Buckeyes won the game 64-61. NEW YORK (AP) — Notre Dame had its first big win of the season almost wrapped up. The Fighting Irish had a seemingly comfortable lead over No. 3 Ohio State with less than 2 minutes to play. Instead of that signature win, Notre Dame wound up with a loss that could be hard to bounce back from, 64-61 on Saturday night in the BlackRock Gotham Classic at Madison Square Garden. "I am so thoroughly disappointed," Notre Dame coach Mike Brey said. "We had such a good chance at such a great win." Ohio State turned up the defensive intensity to close the game on a 14-3 run. 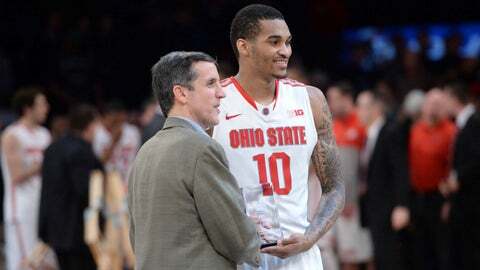 Ohio State Buckeyes forward LaQuinton Ross (10) is awarded with the game’s most outstanding player trophy after the Gotham Classic against the Notre Dame Fighting Irish at Madison Square Garden. The Buckeyes won the game 64-61. "I don’t really know what happened. It was a big blur," Ohio State senior guard Aaron Craft said. "We never stopped. We never gave up. Guys were running around getting tips and guys made big free throws." Lenzelle Smith Jr. scored seven of his nine points in the final 33 seconds — including going 5 of 5 at the line — to lead the rally. "I’m still trying to figure out what happened," Ohio State coach Thad Matta said. "My mind was fixated on if we wanted to foul with the time situation or do we play it out defensively and all of a sudden it was closer and closer and closer and we get the lead. It happened quick, It was a great win." The Buckeyes went 9:10 without a field goal and at one point were 6 of 21 from the field as Notre Dame (8-4) opened up its lead. Ohio State Buckeyes guard Lenzelle Smith Jr. (32) takes a shot against the Notre Dame Fighting Irish during the second half of the Gotham Classic at Madison Square Garden. 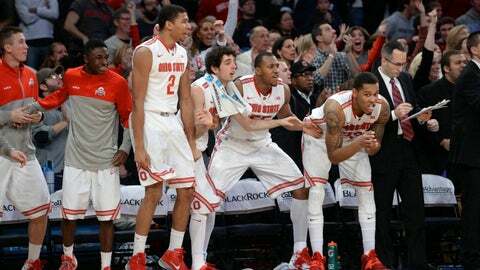 The Buckeyes won the game 64-61. "I thought we did a good job in the zone knowing the shooters and jamming the lane, keeping it to one and done," Brey said. "And then we got into such a good offensive rhythm to get some breathing room. But you are never going to be out of the woods against a team like that." The Buckeyes converted consecutive steals into a 58-56 deficit with 40 seconds to go. "They really turned the heat up on us and flustered us. We had a hard time doing anything right," Brey said. "We didn’t have Atkins, but the other guys should have handled it better." "I’m a senior and I have to find a way to not turn the ball over when we didn’t have our point guard in there," Grant said. "I love how we fought and competed in a road atmosphere but we didn’t finish it," Brey said.